Congratulations, you’re going to be a parent! The good news for modern mums and dads is that there are mobile apps to cover every conceivable stage of the childhood journey: from fertility calendars through to baby monitors and school activity planners. And while they can’t get up in the middle of the night for you to change a nappy, apps can be helpful, entertaining and just really useful when you have a baby. It seems like a simple option, but YouTube is an absolute parenting savour. You can guarantee that you will be able to find clips of most children’s cartoons and programmes that will keep them entertained on long car journeys or when they wake up for the day at 5am. As well as the usual kids TV suspects, there’s also a whole host of weirdness that little ones seem to love: from Kinder Surprise opening clips, to the annoyingly catchy Gummi Bear song, and Susan Boyle’s first TV audition (my daughter’s interesting current favourite). is almost spookily accurate at predicting which weeks your baby is likely to be upset, along with some gentle suggestions as to how you can help them. 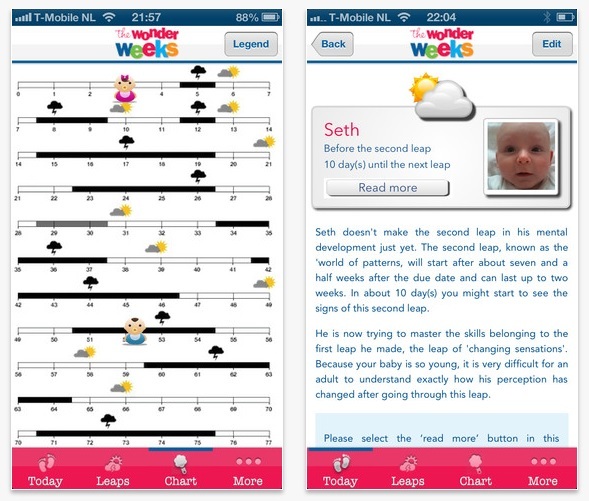 The app is the handy form of the bestselling book, and includes a progress chart that will tell you at a glance if your child is under a dark cloud (bad) or a sun (good!). No naughty steps are involved. Described as a ‘map app for parents on the go’ GoBaby helps London mums and dads find the nearest accessible tube stops and friendly baby-change facilities. Designed and developed by a new mum after she found it difficult to get around the city with a pram, the app lists over 1,000 places including cafes, restaurants, libraries, museums and shops to help you find the nearest baby changing places when you’re out and about. There’s also a comprehensive guide to step-free London transport stations as well as live transport updates, to help make your journey as tear-free as it can be when you have a baby on board. Parents, what are the chances that you’ll actually get to sit down to watch TV in the evening, exactly when you want to? In all probability you will plan to watch a programme, then the baby will wake up and you will miss it. The mobile version of BBC’s iPlayer means you will be able to play TV catch-up, in your own time. wherever you are – in bed, walking round the house, or trapped on the sofa under a sleeping child. Again, a simple and seemingly obvious app suggestion. But parenting can be confusing, amusingly frustrating, and at times, lonely. And Twitter is a fantastic source of advice, solace and entertainment. It’s a simple and instant way of reaching out and talking to other parents, asking for opinions and first-hand recommendations on everything from nappy cream to the best white noise app. If you’re up in the night at 2am you can guarantee that someone else will be too, and right there to chat to. What’s been your must-have parenting app? Leave a comment and let us know.